Three of the greatest singers of all time—all African Americans—were from Newark: Miss Rhapsody (Viola Wells) (1902-1982), Sarah Vaughan (1924-1990) and Whitney Houston, born in 1963. Each singer was a star—the very best in her field and a credit to her hometown. Miss Rhapsody, or Rhap, as she was known, was born in Newark at 21 Scott St. in the East Ward to Earle and Roberta Wells, who came north from Surry County, Va., at the turn of the century. At age nine she became active in the Thirteenth Avenue Presbyterian Church, where she sang in the Salika Johnson Choir. In the tradition of the Apollo Theater, she was attracted to show business by an amateur contest in New York, which she won. Early in her career, Miss Rhapsody performed at the local Elks Home and then with Sunshine Sammy at Charlie Roberts' Plantation Club in Newark. From there she worked at the Kingsland Hut in Nutley, and sang at Miner's Theater in downtown Newark, which helped her career take off. In the 1920s, she worked in clubs in Atlantic City, where gambling was wide-open at the time. In the early 1930s, she played the Club Chincilly in Scranton, Pa., where she said 'nobody paid attention to a black woman unless they were very beautiful or had great gowns.' In the late 1930s, Miss Rhapsody went to Kansas City for a two- week engagement. She was so popular and well-received, she stayed 14 months. Upon returning East in 1939, she was ready for the 'big time, ' appearing with bands led by Claude Hawkins and Bunny Berrigan. In 1940, she was became a mainstay at Kelly's Stable on Manhattan's 52d Street jazz strip, sharing the billing with jazz giants including Art Tatum, Benny Carter, Nat King Cole, Coleman Hawkins and Billy Daniels. She was equally at home on a circuit that included the Crystal Cave in Washington, the Three Sixes in Detroit and the Blue Grass in Cleveland. Back home in Newark she formed a trio composed of Jay Cole, piano; William (Bass) Byrd, bass, and Harold Underhill, guitar, taking them on the road as Miss Rhapsody and Her Three Sportsmen of Rhythm. Tragedy struck when her father was murdered by a minister of a Newark church, prompting her to retire from performing for a time. By the 1960s she was back in the public eye, appearing at Pitt's Place on West Market Street, where she ran the kitchen and sang when the band went on. Author/critic Sheldon Harris ('Blues Who's Who') initiated her return to show business. In the 1970s she became the vocalist for the Harlem Blues and Jazz Band, a group which played jazz festivals all over Europe. In 1979, a fan accidently stepped on her foot while she was performing in London, an injury that eventually caused her to lose a leg because of diabetes. Her career might have ended there, but after six months of rehabilitation she was back singing at the Ginger Man in New York on Sunday nights. Soon a newsman nicknamed her 'The Uptown Alberta Hunter.' At the time, her friend, Hunter, a respected blues singer, was playing the Cookery in Greenwich Village. When Kenneth A. Gibson became Newark's mayor in 1970, he gave Miss Rhapsody the key to the city, for no matter where she went she never failed to mention her hometown. A performer until the very end, she appeared at Sweet Basil's in Greenwich Village just two weeks before her death in December 1984. 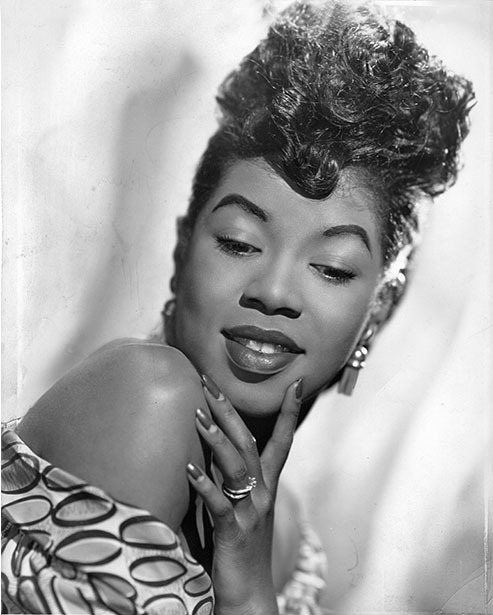 Sarah Lois Vaughan was born in Newark on March 27, 1924, and died in Los Angeles on April 3, 1990. Her father was a carpenter and an amateur guitarist and pianist; her mother, once a laundress, was a choir member at First Mt. Zion Baptist Church. Vaughan attended Miller Street elementary school and later Arts High School. In her childhood, she lived on Brunswick Street. Some years later her parents moved to Avon Avenue. As a student she took piano and organ lessons for ten years from Miss Josephine King of East Orange, and accompanied the church choir. As a young girl she would sneak into a neighborhood bar to hear the great trumpeter Jabbo Smith play. In 1943, at age 18, she entered an amateur vocal contest at the Apollo Theater on a dare from a friend and won first place. Soon after, she was signed by Earl (Fatha) Hines, working also with Dizzy Gillespie and Charlie Parker. When Billy Eckstine, who discovered her, formed his own band, she joined in June 1944. For several years she 'paid a lot of hard dues, ' singing on road trips that lasted anywhere from three to eight months at a time in big cities and small towns. In 1945, she met her soon-to-be manager and husband George Treadwell, who booked her in New York City's Onyx Club. There, she acquired the nickname 'Sassy.' Quickly, she moved to the top of her field, appearing at places like Manhattan's Birdland. Her records began grossing more than $1 million annually, a staggering figure at the time. Vaughan's first blockbuster record, 'Broken-Hearted Melody, ' made her an international star. TV guest appearances followed on shows featuring Perry Como, Ed Sullivan and Jackie Gleason. There was hardly a major jazz musician Vaughan did not know or appear with on stage, but she especially enjoyed performing with the Count Basie and Duke Ellington orchestras. The youngest of Newark's three divas is Whitney Houston, born in Newark August 9, 1963, to John and Emily (Cissy) Houston. Cissy Houston, a star in her own right, was born Emily Drinkard in 1933 and appeared with the Drinkard Singers, a group that eventually included her nieces Dee Dee and Dionne Warwick. She also was lead vocalist with the Sweet Inspirations, a group that appeared as background for vocalists Solomon Burke, Wilson Pickett and dozens of other popular singers. Some of Cissy Houston's best-known records include 'I'll Be There, ' 'Be My Baby, ' 'Think It Over, ' and 'Tomorrow.' In recent years, she's devoted herself to directing Newark's New Hope Baptist Church Choir. John Houston, Whitney's father, was executive secretary with the Newark Central Planning Board during the Gibson administration. Whitney, like other famous members of her family, grew up singing at church and school. Imagine having a mother like Cissy Houston to train and guide you when you are interested in a professional musical career. Not only does Whitney Houston have an inspiring voice, she is beautiful—a former fashion model who as a teenager appeared in the pages of Vogue, Seventeen and Cosmopolitan. After graduating in 1981 from Mt. St. Dominic Academy in Caldwell, she signed with Arista Productions. In 1986, she hit the top of the pop charts and won several Grammies. Whitney Houston's rise to the top of the national pop charts was based upon careful career planning, personal style and hard work. The 33-year-old superstar puts her faith above all else. As she has often said, 'It's important to anchor yourself to God, ' noting that 'prayer helps a lot.' As one critic pointed out, she's 'at home with up-tempo R'n'B and disco. And the critic considered her especially effective on ballads.